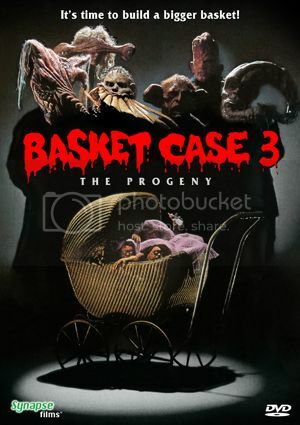 Just released in October from Synapse Films is the third film in the Basket Case trilogy. Originally released full frame by 20th Century Fox almost 10 years ago, we finally get the film with an Anamorphic Widescreen transfer (and boy is it an improvement). As with Basket Case 2, I had never seen this sequel until now but I distinctly remember seeing the old VHS box frequently (I always mixed it up with It's Alive because of the mutant in the baby carriage). Following the story of separated conjoined twins Duane (Kevin van Hentenryck) and Belial, the story begins with Duane locked up in a straight jacket by Granny Ruth (Annie Ross), his aunt (?!?) who is keeping him in her house with a group of freaks. He has finally accepted that he does fit in and wants to be with his brother, who we learned at the end of part 2 is about to become a father. Granny Ruth takes the whole clan on a school bus to Georgia so her friend Hal can help Belial's girlfriend Eve deliver their child(or children as it turns out). The local police force get involved after learning that there is a million dollar reward for the capture of the twins. Splatter ensues. Call me crazy but I actually thought Basket Case 3 was more enjoyable than part 2. It was part horror, part comedy, part romance, part road movie. It really had it all. The movie took a little while to get going but when Belial finally takes his revenge on the local police force we are treated with some great, gory, imaginably hilarious death scenes. The makeup FX were very well done and the story was funny and inventive. The new transfer from Synapse is the best the film has ever looked and there is also a trailer included. If you like splatter films or the other Basket Case movies, check this one out.